Keith Urban will host the 4th Annual All for the Hall event at Nashville's Bridgestone Arena on April 16, but the superstar's fundraising effort for the Country Music Hall of Fame and Museum is already well underway. 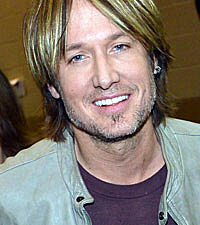 Keith recently partnered with www.rally.org to challenge fans to raise $10,000 in advance of the star-studded concert. "Proceeds from this campaign will go to the museum, its preservation efforts, education and exhibitions on country music and its importance in the past and present," Keith explains. Watch the video -- and join the fundraising campaign -- here. Rascal Flatts will co-headline a concert with Journey this summer. The bands will play Hershey, Pa., on Aug. 1 with special guests the Band Perry and Cassadee Pope. The groups first performed together at the 2012 CMT Music Awards, and they filmed a "CMT Crossroads" earlier this year. "Our respect for them as musicians deepened through the television shows we did together that talk soon lead to wanting to do more," Rascal Flatts' Gary LeVox explains. Tickets go on sale Friday, April 12. Beginning today (April 9), Billy Ray Cyrus' 13th studio album, Change My Mind, is available at Ryan's Country Buffet, HomeTown Buffet, Old Country Buffet and Fire Mountain restaurants for just $8.99. Proceeds from sales of the CD will support the Armed Services YMCA (ASYMCA) for Operation Outdoors, a camp program launched in 2007 to assist the children of military personnel during deployment, allowing the young people to take a break from everyday worries and have fun with new friends who are going through the same experiences. In addition to the camps for children, the ASYMCA sponsors camps that reunite families with loved ones returning from overseas service so that they can take mini-getaways to the outdoors and spend quality time with each other. For more information, click here. Additionally, Ashley will be performing a free online concert Monday (April 29) as part of the "Live From Music Square" series. She'll also answer questions directly from her fans beginning at 8:00 PM ET here. Aaron Lewis will headline the 4th annual Jägermeister Country tour, which kicks off May 1. Rick Monroe will be among opening acts on the trek, which ends June 23 in Evansville, Ind. Tickets are available at Ticketmaster or directly through the venue's websites. Click here for a full list of cities and dates on the trek. Sawyer Brown lead singer Mark Miller delves into the movie world with "Ring the Bell," a film that he co-wrote and produced. The faith-based flick is about a big city sports agent who gets stranded in a small town, forcing him to reflect on his values and his fast-paced life. The movie features several Christian music artists, including Steven Curtis Chapman, Matthew West and Mark Hall, along with some big names in Major League Baseball. "Ring the Bell" was released on DVD today (April 9). Nashville's Country Music Hall of Fame and Museum will unveil a special exhibit dedicated to country legend Lee Greenwood on May 10. "Lee Greenwood: American Patriot" will include costumes and other memorabilia spanning the "God Bless the USA" singer's 50 years in the music business, along with a tribute to his unwavering support of the military. The exhibition will run through April 25, 2014. This week, Kelly Clarkson and Scotty McCreery will return to the show that shot them both to superstardom. The two are set to perform on Thursday's (April 11) "American Idol" results show, which begins at 8:00 PM ET on FOX. Brad Paisley will perform on tonight's "Dancing With the Stars" results show, singing "Southern Comfort Zone." The show airs at 9:00 PM ET on ABC. Brad's new album, Wheelhouse hit stores today. Read our exclusive interview with the country superstar here, and watch a video below about one of the more controversial tunes on the disc.